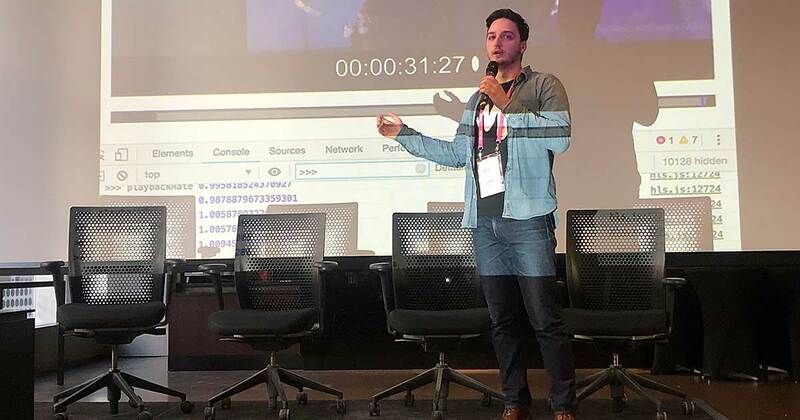 At this week's Reframe forum in New York City, video coding professionals heard an update on LHLS, or low-latency HLS, delivered by John Bartos, a senior software engineer for JW Player. Reframe is something of an East Coast Demuxed conference, and Bartos was building on a topic he introduced at Demuxed 2018: creating a low-latency standard that works for all platforms. LHLS is a modification to the HLS specification, Bartos explained, and it brings latency down to two to seven seconds. The project's goal is to overcome the fundamental problems with HLS that prevent video players from achieving low latency today. "The HLS standard requires encoders to only advertise a segment, meaning a piece of media, when the last byte has been added, or encoded," he explained. "After that it is delivered across the wire to the client. And so your minimum theoretical latency becomes essentially the length of a segment because you need to capture X seconds of video before you can deliver X seconds. So six-second segments' theoretical minimum is six seconds. In practice, players take about three times a segment length behind that point, and that is just for stability of the buffer and network conditions." The LHLS is an open standard and is backwards compatible. It differs in that encoders can advertise the currently encoding segment to the client, and segments can be download via a series of smaller chunks instead of in larger segments. In the last six months, the project received support from multiple encoders, including Akamai, Wowza, and Mux. The project has also received verbal commitments ("Maybe they were over beer, but we have commitments") from Twitter, Periscope, Hulu, and others. At Reframe, Bartos asked publishers to get involved and join the open beta. He's now focused on creating a server-side ad insertion solution. He's also refactored Hls.js to make it progressive by default. Hls.js users who aren't concerned with live or low-latency streaming will still benefit from the player being progressive, he said. Even when using segments encoded 10 years ago, playback should be faster and more reliable. As Bartos talked, a prerecorded demo of Hls.js playing an LHLS stream played behind him. It buffered occasionally; it's still a work in progress. 'This has been the culmination of a lot of engineering effort," Bartos said, thanking the community for its support. "I'm looking forward to continuing to work with everyone and getting this out to GA."
Photo: John Bartos of JW Player at the Reframe forum. With Microsoft's backing, Haivision hopes to grow global support for the standard. The SRT Alliance now counts over 140 member companies.